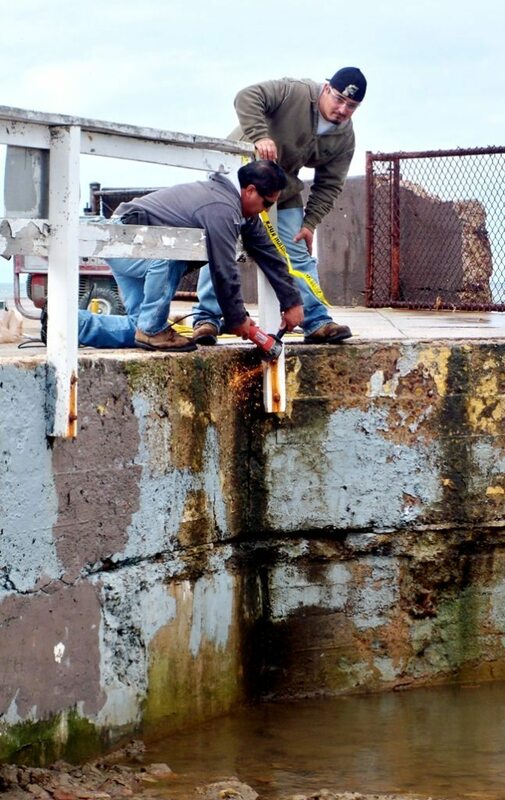 Carlos Dominguez and Antonio Santillano came to Ocean Beach Tuesday morning to replace a damaged fence. The fence, which surrounds the now-defunct saltwater pool, was knocked down last month during a day of large waves and high tides. Carlos and Antonio work for South Bay Fence of Chula Vista, the company in charge of the project. The saltwater pool is also known as ‘the Sandbox’ (because it’s currently filled with sand) or ‘the Plunge’ (as it was originally dubbed in 1917). What remains of this once-glamorous attraction appears to have been hit by a bomb. Concrete rubble coexists with splintered wood and public supervision is sparse at best: it’s the kind of place you might witness a fistfight or step on a shard of glass. But I love the pool, despite the fact that the fences are washed-out regularly. The Plunge is a treasure, a relic of bygone era when Ocean Beach yearned to become a ritzy waterfront wonderland. I can’t help being impressed by the crazed entrepreneurial visions of William Doughtery, who chose the mussel-infested tide pools as the perfect spot to build the Plunge. (Just think for a moment about the absurdity of building an indoor saltwater pool essentially on top of the ocean.) But, he built it. And according to a historical marker beside the pier, serious athletes trained here including the famous English Channel swimmer Florence Chadwick, San Diego’s first female surfer, Faye Baird, and one of the first water ballet groups. These days, OB is a far cry from the La Jolla Beach and Tennis Club aspirations of Doughtery. For that, I’m grateful. Would it be terribly un-San Diegan of me to admit that I prefer contemplating the waves as they crumble against the old saltwater pool, over an afternoon of tennis? I apologize for the following nostalgia. But isn’t there something about restoration projects (whether it’s mending fences or refurbishing a vintage Gerry Lopez surfboard) that inevitably conjure up memories of the past? 1917: William Doughtery begins construction on the Silver Spray Apartments and Plunge . 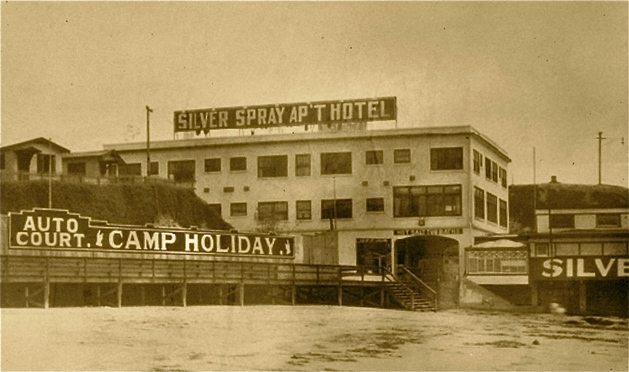 1919: The Silver Spray hosts its Grand Opening. The Treaty of Versailles officially ends WWI. 1920: Prohibition begins. Ocean Beach enters its legendary resort era. Camp Holiday’s row of bungalows serve as an auto camp for newly popular car travelers. Silver Spray and Camp Holiday become the center of activity. Guests and locals alike enjoy the spa, skating ring, dance hall and saltwater plunge. Apartments rent for $30-40 per month (which includes access to the plunge). 1925: The Natatorium, a saltwater pool, opens in Mission Beach. 1957: Sputnik 1, the first artificial satellite to orbit the earth, is launched in The Soviet Union. 1965: The first episode of Gidget airs on ABC. 1970: The first issue of the OB Rag is published. Development and land-interests press for the development of Ocean Beach’s waterfront, with plans for tourist-oriented resorts, hotels and a marina prepared in the Precise Plan. 1972: The passage of the 30 foot height limit. 1975: With the re-writing of the Precise Plan, the commercial assault of the OB waterfront is defeated. 2002: Chuck Fisher, owner of the OB Pier Cafe, surveys damage from a large wave. The wall between the dining room and kitchen moved three feet. 2009: A historical marker commemorating the Silver Spray Hotel and Plunge is placed on the pump house. The area continues to serve as a public walkway, linking Sunset Cliffs to the boardwalk. 2010: March 2nd, Carlos and Antonio have finished replacing the damaged fence posts. The beams and banister were painted a very bright shade of white, and they stand out from the others like unblemished new skin. I know the remnants of the old salt pool can’t last forever. They are assaulted daily by the endless movement of the ocean and the slow corrosion of sunshine and saltwater. But it’s nice to sit and enjoy the past while it’s still here. very cool story. thanks for that. Never knew the fence surrounded anything of historical significance. Like our own little ruins. I do wish the current owner of the Saltwater Apartments would keep the remaining building in better shape. It’s an eyesore. cool OB history lesson. Thanks. Thanks! I’m also a fan of the Wonderland shows by Noah Tafolla. That and Frank’s OB timelines have helped bigtime in expanding my knowledge of local history. Always love to read history of my new last home town. Don’t forget just a little over 3 years until the 100th anniversary of the WONDERLAND amusement park. Hey, that’s just enough time to dredge the pool, fill it up with clean water, and hold a floatopia. OB stiLL haS oNe LittLe toE iN thE PasT.. The things you write seem somewhat interesting but I can never do more than briefly scan your posts because of your psychopathic capitalization fetish. I don’t speak your crazy moon language! At one time the Ocean Beach Historical society adopted this area due to it being somewhat of a no mans land prone to neglect . We painted the railings, placed some garbage cans , and in general just tried to keep the area a little cleaner. After some time the city started maintaining it a little better so we discontinued our efforts. I believe the situation is it’s part of the Silver Spray Property. But because of public access and liability issues they don’t have anything to do with it so it’s up to the city to maintain the area. I think whats remaining will be there for a long time to come. I was thinking it would be cool to do a mosaic tile mural dipicting it’s history on the pool wall, it would look nice and be mostly inpervious to the elements. Maybe doing something similar to the streetfair community mural where many people could be involved. Just an idea. As far as the Silver Spray Apartments it is a bit rough looking. I hope the owners do something soon. A coat of paint would would be a big improvement. I know people who live there and really like it. Especially the History! I plan to visit the Historical Society soon to answer lingering questions… I’m still wondering when and why the Plunge was eventually closed. What happened to the roof? Was it demolished, did it cave in? In old photos I notice what looks like a brick chimney and a sign that reads: Hot Salt Tub Baths, so I’m guessing it was heated. Swanky! Personally, I find the crumbling state of the walls to be really pleasing. They almost look like the old ruins you’d see in Greece or Italy, I think they compliment OB’s scenery nicely. (Just for the record) when I say “concrete rubble” and “splintered wood” I mean it in the most affectionate way. Beach Cleanups like the ones embarked upon by the Historical Society, are helpful to everybody. The task of maintaining an actively-eroding site for public use is a tricky one. Joggers at Sunset Cliffs risk life and limb and tide-poolers must always walk upon super slippery rocks. I’m not a big fan of falling, but there is something rugged about OB’s charm that keeps me happy. A mosaic tile mural depicting the pool’s history would be awesome! Nice idea. What we were told by beach cops is that the Plunge is officially part of the beach. We’d asked them when my sis was a resident at Silver Spray, and we wanted to party for July 4th there…. anyway, it’s apparently under normal beach laws (i.e now there’s no drinking or smoking allowed if your feet are on the sand.) Just thought I’d throw that out. But that spot is so great, and I really enjoyed reading a history of it – good job! First of all, my son and I love OB. We are super comfortable in this town and really like the atmosphere. I am the property manager at Silver Spray for the last two years. I started out very interested in attending the OBMA meetings and would like to be a part and contribute to the community however possible but after the first meeting and a couple conversations I realized all that was going to be directed at me everytime is “How come your building isn’t painted, it’s an eyesore”. I assure you, I would have it done in a heartbeat but my company has other concerns and priorities right now. That’s why I don’t even have my deck. It IS a Historic site and with that comes extra fees for permits and such even to work on the outside. In the two years my son and I have been here I have remodeled, renovated and restored security to my worn down building. Although it looks beach-ghetto on the outside, the insides are brand new. I have done everything I have been allowed and authorized to do as far as my property goes. I wish people weren’t so critical about the appearance, my hands are tied. And even though I want to take part in this community, I will not go and be bashed for something I have no authority to change. As far as the pool goes, that is city property. I wanted to turn it into a volleyball court but was denied because of possession issues. I hope that helped clear up some things for people with questions regarding the current state of the exterior of my property. Have a stellar day. The Silver Spray Apts are “perfect”! want “new” this or that , I think you are a wonderful On-Site Manager. Very quiet, clean ,and that’s what counts . Those are good questions that I don’t have the answer to right off the top of my head. I’ll check with one of our board members, Ned Titlow, he took swimming lessons there from Florence Chadwick herself. He’ll probably remember. According to Ruth Varney Held in her book, Beach Town Early Days in Ocean Beach, the resort days pretty much ended in 1930. I think during the 30s is when you started to see a decline in some of the beach side attractions, the bath houses,dance pavilions, the carousal,Spalding Park, and the like. It,s amazing to look at it now and imagine what it must have been like to be in OB back in those days . Fall 1966 The World Surfing Championships are in OB. Australian Nat Young wows the crowd by warming up on the waves on the South side of the newly built OB Pier. The event marks a major turning point in surfboard design and riding styles. When was the big storm surf? 1939? I’ve seen pictures where it looked like OB was hit by a giant bomb. It would have had a huge impact on the pool at the Silver Spray. Wreackage of the Flat Iron building at the foot of Abbott St. which was destroyed by high tides Oct 18 1941. The building an old wooden land mark on the beach was more than 20 yrs old, and was built on piling just outside the Abbott St curb line. It was occupied by the Ocean Beach Womans Club, a cafe, and five apartments. Loss was reported at 6,000 to 8,000 dollars according to the OB news of Oct. 24,1941. This was one of the few times that high tides have caused any damage in Ocean Beach. Nate,… the same issue has an ad for the Silver Spray Apartment Hotel-Motor Court. “On the beach in Ocean Beach” Semi-private beach and play ground in connnection. Transient Accomadations For your out of town friends. Now available. Weekly rates for extended stays. Compeletly remodeled,refurbished, and reconditioned. Electric refridgeration, maid service, and desk service. Reservations now being accepted for our 12 new motor court units on or about December 10th . All units are equipped with a telephone. Owned and operated by Roy Riner. Mr. W. B. Mix, resident manager, assisted by Mrs. S.H. Stephens. There is no mention of the Silver Spray Plunge. Semi-private beach? Does that refer to the Sandbox? Does this mean that the Plunge was built after ’41 or demolished sometime before ’41? This would have been after the plunge was closed down. I have a feeling the semi private beach would have been the sandbox. Still checking on when it would have been closed. I have a hunch it was during the depression. About 12 years ago The Ocean Beach Historical Society rescued around 10 years of the early OB news and had it put on micro-film. I hope to some day soon have it available to view on our web-site, obhistory.wordpress.com. This past Friday and Saturday I attended a local history conference. It was put on by The Congress of History of San Diego and Imperial Counties a organization made up of most the local Historical Societys and museums in both counties, and co-sponsored by the San Diego Police Musuem. This years theme was Untold tales of Public Safety and Service. This was the 45th annual. It was my 5th year attending. I’am so inspired by these people, and historic events of this region. I never thought I would be so into history. It all started with my interest in OB history. I know that this article is a bit old, but I have to say WOW! I grew up in O.B. my entire life (as did my father, and his mother moved there in the 30’s), and I’ve passed the pool a million times over without ever knowing what it was. I read your blog every day to keep in touch with home (I am in PA now), and cruise your back articles regularly. I have to say this article impressed me and taught me something about my home that I never knew before. Thank you, OB RAG, for making my day, and giving me little bits of home from afar. Underthe ice plant on the back wall was my stash place. I could watch it from the lot. On hot days it’s real nice to sit in the sand with a fatty and a cold one.Right around the corner is the cool water of the Pacific.